Announcing a new version of Tess (1.4) Originally uploaded by Paper Mosaics. Alex Bateman has released a new version of his landmark software, Tess. Tess allows you to create all sorts of tilings, and modifications of those tilings- so you can explore possibilities without having to fold it all out in paper, first! Also, this new version provides PDF export capability, which is a major plus for windows users. Tess is a Perl application, and will run on any Perl-capable system with a bit of tweaking. (This means you, Linux/FreeBSD/MacOSX users.) Or, if you’re running windows, you can download a standalone version, which will run on it’s own without requiring any Perl resources. Both of these are available to download from Alex’s website. Download the latest version of Tess! Lotus Originally uploaded by tekuila. I found this origamic architecture piece really quite beautiful- from my flickr contact tekuila. Wonderful color choices and a great design. I love seeing these kinds of things. little face Originally uploaded by origami joel. 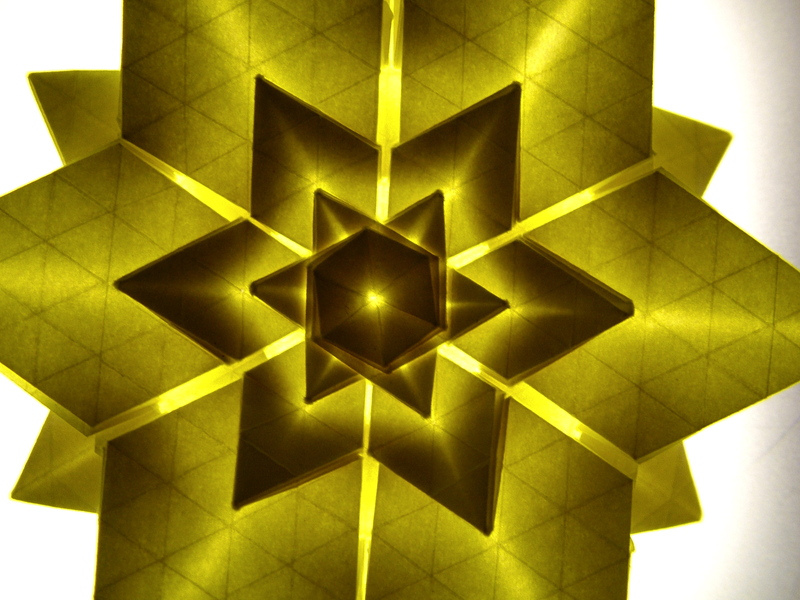 There’s been a lot of “nano-tessellations” folded on the Origami Tessellations group on Flickr lately; Joel Lorenzo Marchi started this madness off a while back, and the ante keeps being upped by various people folding smaller and smaller designs. (See some other patterns from Ralf Konrad, for example.) But of course Joel came back with this: part of a mask, folded from tiny, tiny pleats, less than 4cm across for the whole piece. Wow. That’s really quite something!